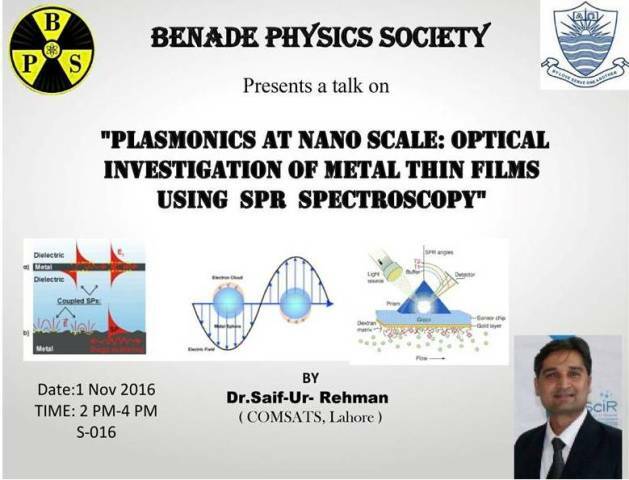 On 01 November 2017, Benade Physics Society organized a talk on “Plasmonics at nano scale: Optical investigation of thin films using SPR Spectroscopy” by Dr Saif-Ur-Rehman from COMSATS, Lahore. This talk was especially for BS (Hons), MPhil and PhD students interested in research. 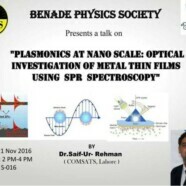 This talk helped the students to understand applications of metal thin films, preparation of metal thin film and its investigation via lasers.